Every year my mom, my sister, and I make the same kinds of cookies around the holidays. The cookies are delicious and bring back happy, nostalgic memories each and every time they’re baked, but like the cherished cool whisper of autumn’s arrival at the end of a scorching hot summer, sometimes change is good. A new festive cookie is always a most welcome addition to our holiday repertoire. That’s where these Date-Filled Cookies (called Ma’amoul) come in. They are beautiful cookies that my mother-in-law makes for the Eid (meaning “Festival”) at the end of Ramadan. These cookies can be stuffed with a number of different fillings, but date filling is traditional for celebrating holidays. Walnuts (flavored either with cinnamon or orange blossom-scented simple syrup) and pistachios (flavored with scented simple syrup) are also common fillings. These cookies are one of my favorite desserts from my cookbook, An Edible Mosaic: Middle Eastern Fare with Extraordinary Flair, which was released on November 6. 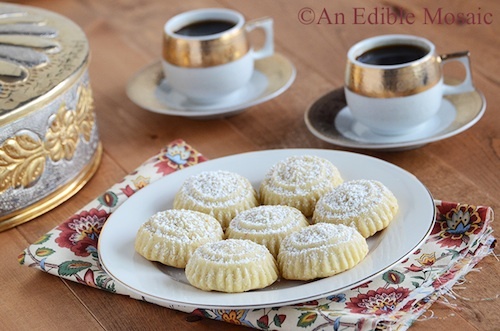 In the cookbook, I show step-by-step photos for how to use a Ma’amoul mold to fill these cookies, and I also give directions on how to shape and fill these cookies by hand without a mold…it’s easier than you might think! See giveaway details below to get your very own copy! A lot of people tell me that when they buy a cookbook, they flip right to the dessert chapter, so to whet your appetite, here are a couple other sweet treats from the book…a creamy pudding called Layali Lubnan; the name means “Lebanese Nights” – doesn’t that make you feel like it’s straight out of one of the tales from Arabian Nights? There’s a sweet cheese pastry called Knafeh (which we served at our wedding!). And what is maybe my favorite Middle Eastern dessert, Qatayef (or just Atayef in slang), which are Middle Eastern pancakes that can be stuffed with cream, cheese, or nuts, and are also sometimes fried and served with a drizzle of simple syrup. The book has over 100 authentic Middle Eastern recipes that are streamlined just a bit for the way we cook today, with unique ingredients demystified and approachable, easy-to-follow cooking techniques thoroughly explained. I include a few classic Middle Eastern favorites (like Hummus, Falafel, and Vegetarian Stuffed Grape Leaves), but there are also a few that might become new favorites, like Red Bell Pepper Walnut Dip (Muhammara), Lentil and Bulgur Pilaf with Caramelized Onion (Mujaddara Burghul), and Meat and Vegetable Casserole with Pomegranate (Kowaj). I also share my method for making the most tender and flavorful Chicken Shawarma at home without any special equipment. This cookbook is incredibly special to me because it contains a treasure of my in-laws’ family recipes; after marrying, I spent six months in Damascus where I learned the ins and outs of Middle Eastern food from my lovely Syrian mother-in-law, Sahar. The culture and the cuisine truly enrich each other, which is why I include cultural tidbits throughout the book. I hope you enjoy these cookies as much as I do…and maybe they’ll become the basis for a new tradition in your family! 1. Mix together the spices for the Cake Spice Mix. You will only need 1 ½ teaspoons of the spice mix for recipe; store the remaining spice mix in an airtight container at room temperature for up to 6 months. 2. To make the date ﬁlling, grind the dates and oil in a stand mixer ﬁtted with a food grinding attachment (ﬁne grind) or in a heavy-duty food processor. If using a stand mixer, alternate between adding the dates and oil. If you’re using a food processor, before you add any dates, rub oil on the blade and inside of the bowl. Once processed, oil your hands and knead the Cake Spice Mix into the dates. 3. To make the dough, combine the sugar and water in a small saucepan over medium heat; bring to a full, rolling boil (occasionally giving the pan a swirl), boil 1 minute, and then turn off the heat. Cool 5 to 10 minutes. 4. Combine oil and clariﬁed butter in a separate small saucepan and cook over medium heat until the butter is just melted, about 2 minutes; cool slightly. 5. Put the ﬂour in a large bowl and whisk in the yeast. Use a wooden spoon to gradually incorporate the oil mixture, then gradually incorporate the sugar syrup. Knead the dough until it comes together nicely, adding up to 4 tablespoons more ﬂour as needed (when done, the dough will be soft and should look smooth, shiny, and slightly oily). Cover the dough, put it in the freezer to stiffen slightly, about 5 to 10 minutes, and then knead it again for a couple minutes. 6. Preheat oven to 350°F (175°C); line 2 large baking sheets with parchment paper or silpat liners. 7. To shape the cookies with a Ma’amoul mold, measure 1 slightly scant tablespoon of dough and roll it into a ball; slightly ﬂatten it with your hands, then press it into the bottom and up the sides of the mold. Measure 1 teaspoon of the date mixture and roll it into a ball; slightly ﬂatten it and gently press it into the dough in the mold. Measure 1 slightly scant teaspoon of dough, roll it into a ball, slightly ﬂatten it, then put it on top of the date mixture in the mold; use your ﬁngers to press the dough on the top into the dough on the sides. To remove the cookie from the mold, hold the mold by the handle and tap the flat rim on a secure surface; the cookie will drop right out. 8. Arrange the cookies on the baking sheets about ½ to 1 inch (1.25 to 2.5 cm) apart (if you use 2 half-sheet pans, the cookies should all ﬁt on 2 pans; if you use smaller pans you will need to cook them in 2 batches); bake until light golden brown on the bottom, about 20 to 25 minutes, rotating the trays once. ABOUT FAITH: Faith Gorsky is the writer, recipe developer, photographer, and food stylist behind the blog www.AnEdibleMosaic.com. She lives in Upstate New York and loves to travel, especially to places steeped in rich culture and history. Her favorite thing to do is go into the kitchen hungry, open the fridge, and start creating; she also enjoys reading (cookbooks mostly), vintage shopping (especially in old markets), watching movies (of all genres), and is enamored with ancient cultures (especially Rome and Egypt). Her first cookbook, An Edible Mosaic: Middle Eastern Fare with Extraordinary Flair (Tuttle Publishing), which is a collection of authentic Middle Eastern recipes handed down to her from her husband’s family, was released on November 6, 2012. Faith can also be found on her online photo gallery, as well as Facebook, Twitter, and Pinterest.